In the 24 hour news cycle they call it “feeding the beast.” Hungry for news and having to broadcast something new and interesting (regardless of it being newsworthy), the stations will run just about anything to keep the behemoth happy. I’ve been a bit under the weather (which will go from record lows early this week to highs near 70ºF at the weekend… it’s no wonder my system’s gone all wonky.) And I haven’t been able to run or to get out much aside from completing the most mundane errands. Missed the Saturday dance, heard they crowded the floor… . Last year I took an art history course and found the experience very stimulating. Thoughts raced through my head and I saw the world with new eyes. But with the schedule being off, the illness, the “chores”… my brain needs scratching. Perhaps, during these early days of March, yours does too? Here’s my plan. Rather than post just anything, I am taking the rest of today and tomorrow off. I intend (whether or not I succeed remains to be seen) to read an article in The New Yorker, perhaps start a new book, watch a little “Civilisation” by Lord Clark, or “Can Can” with MacLaine, Chevalier, Jordan and Sinatra, “The Pink Panther” with Niven and Wagner (or anything with Cary Grant,) turn up an inspiring piece of music and stroll the barely ice-free sidewalks. Besides I have a menu for six to plan for tomorrow night and Mrs. E. is out of Champagne. But that can happen tomorrow. Oh, one last piece of housekeeping… if you’re reading this and wondering about what to wear on your casual Friday, thank Mrs. PvE for the sartorial inspiration. Spring will win out…. This entry was posted in Cultivating. Bookmark the permalink. Ah, I see you are “in the pink” which by the way takes confidence. I admire easy and elegant confidence. Good luck with the dinner for 6. Do share the menu with us. 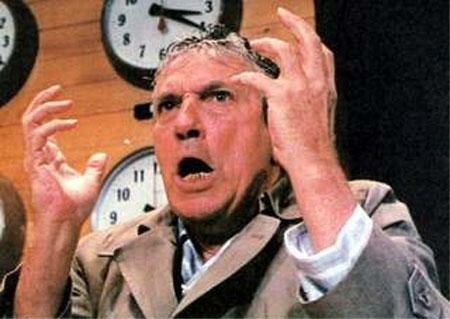 Sorry, but the actor in “Network” is Peter Finch, not Albert Finney. Thanks Mr. de Castro, mistake corrected. Will do Mrs. PvE! Thanks. Much more elegant convalescent attire than what I’ve been able to muster this cold and flu (having had both) season. A true inspiration. Resplendent! The navy blazer is classic and it looks great on you. I like the colours combination of pink and grey. 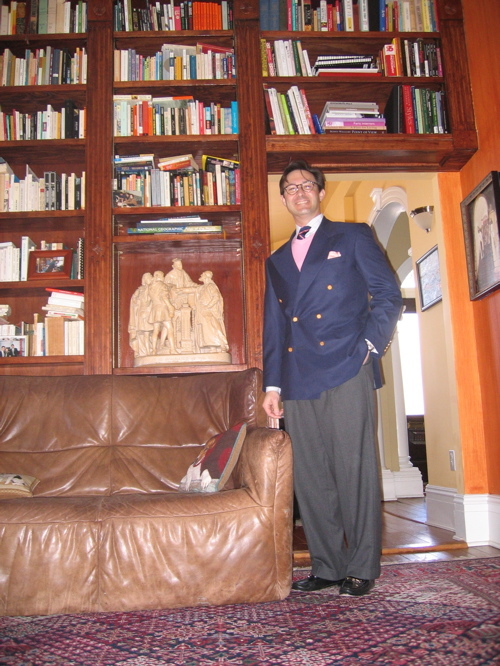 When the weather gets warmer, you might want to wear a cerise pink trousers and a navy blazer. I saw an old gentleman wearing that in a countryhouse garden party. His pink trousers stole the show! Everyone looks good in pink. Today is unnaturally warm and I am sporting a lovely pink and white striped shirt belonging to my husband. Not to worry, I have permission! Smidge worried – are you feeling better? My good man, we certainly hope you are alright. Thanks for the concern. Buried with a couple of things and spring break for Mrs. E. is getting in the way… just back from impromptu visit to D.C. . Back soon. A great Double breasted jacket and I don’t think pink takes confidence..just panache.. I second Mrs.Blandings. Do we need to send a posse.